In a letter addressed to DePauw Faculty, the Board of Trustees called the result of the vote of no confidence “disheartening” as 31 percent of the voting-eligible faculty voted “yes” that they had no confidence in President Mark McCoy. The voting results were released Thursday, Nov. 19 via an email from Faculty Chair Howard Brooks. The email from Brooks reported that 206 of 266 eligible voters cast ballots, resulting in a 77 percent response rate. 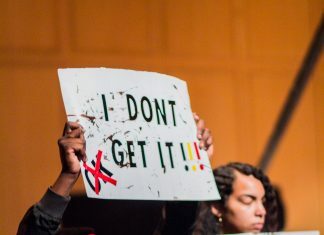 The vote was 83 members who voted “yes” to having no confidence in McCoy, 64 faculty members voted to abstain, and 59 voted “no,” meaning that they do have confidence in the university president. In the letter, shared with The DePauw by Professor of Computer Science Doug Harms, the trustees asked faculty to participate in the planning of an on-campus forum between faculty, administration and trustees in hopes to “continue the dialogue that has begun toward a better DePauw.” More details about the forum were not available at the time of this publication. Ultimately, the Board of Trustees controls the hiring and firing of the president. This letter is the second letter the Board of Trustees sent stating their support for McCoy, the first letter was sent on Nov. 13 before the vote of no confidence.